When Walt Disney told his artists to model Bambi on a California mule deer, Jake Day insisted the real Bambi had to come from Maine. Maurice 'Jake' Day was one of Disney’s earliest and best known animators and an avid outdoorsman from Damariscotta, Maine. Edmund Ware Smith’s stories of the outdoors often featured Jake Day and a band of friends back home. They called themselves ‘Jake’s Rangers. Day illustrated Ware’s books, as well as books by Henry Beston and articles in the Atlantic Monthly magazine. He also worked as an editorial cartoonist for the Maine Sunday Telegram before joining Disney’s studio in California. The book is considered one of the first environmental novels. The Library of Congress placed Bambi on its National Film Registry because of its eloquent message of nature conservation. The Bambi who appeared in the novel was a roe deer who lived in a European forest. But roe deer don't live in the North American wilds. So Disney decided to use a mule deer from Arrowhead, Calif., as a model for Bambi. Jake Day would have none of it. To get the right deer and the right forests, Disney would have to go to Maine, he said, and find a white-tailed deer. Disney challenged him to prove his point. Jake Day returned to his Maine home, which his family had owned since 1798. Day took his camera, his backpack and his friend Lester Hill to the Mt. Katahdin region. They then spent months shooting more than a thousand photos of Bambi country. Disney had given Jake Day a list of things he wanted photographed. The list included hazel nuts, marsh grass, oak leaves, pine cones, birch bark, low-bush and high-bush blueberries, red maple and speckled alder trees. Jake Day shot trees glittering with ice, snowy beaver dams and trees charred by fire. He photographed the details of the forest floor: the lichen, leaves, ferns, pools, rotting logs, pitcher plants, autumn leaves, a bear cub’s footprints in the mud. He shot at all hours of the day – sometimes at 4 a.m.
Day and Hill studied the script for Bambi in their tent at night to decide what to shoot the next day. What kind of log should Bambi trip over? What was the right setting for Thumper? Jake Day and the white-tailed deer prevailed. 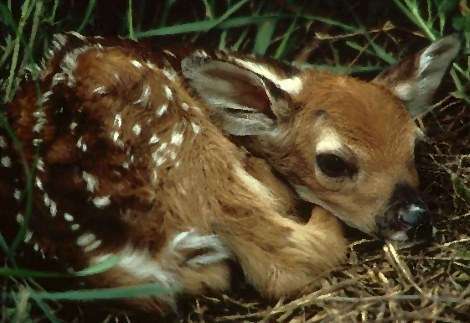 He helped arrange for two four-month-old Maine fawns to model Bambi and his sweetheart Faline. The fawns took a four-day train ride from Maine to Hollywood. The Disney artists didn't know how to draw deer, and were given special instruction by an animal anatomist. For nine months they sat in a circle around the real Bambi and Faline and sketched them as they lost their spots and grew into adulthood. A few of the drawings became deer fodder. 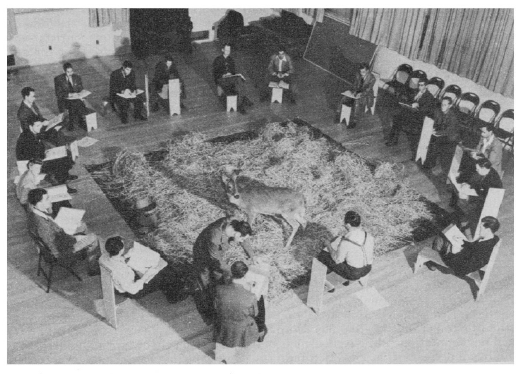 Artists study the real Bambi in this photo from a Collier's Magazine Article promoting the film. Bambi premiered in London on Aug. 8, 1942, then in New York, and had its first public showing – appropriately – in Portland, Maine. He climbed Mt. Katahdin on his 75th birthday and would have done the same on his 80th but the black flies were too bad. He died at 90 years old in 1983 at home in Damariscotta. In 2011, Bambi was added to the National Film Registry of the Library of Congress. The American Film Institute ranked as third on the list of the Top 10 animated movies. 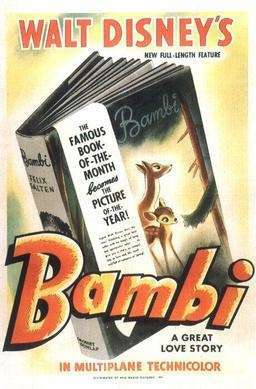 Images: Bambi movie poster By Source, Fair use, https://en.wikipedia.org/w/index.php?curid=3891543. This story was updated in 2018. I don’t know what link was supposed to connect to “the disembodied voice has been heard to say….” link, but here is a link to buy the book about the story!